The Parking Violations Bureau tells us this is a list of the 20 people (21, actually) with the highest number of outstanding tickets (that's why some who owe more are lower on the list.) And by the way, the city considers anyone with three or more outstanding tickets to be a scofflaw. Wondering if you're in danger of ending up on the list? The city has posted a list of people with outstanding tickets. 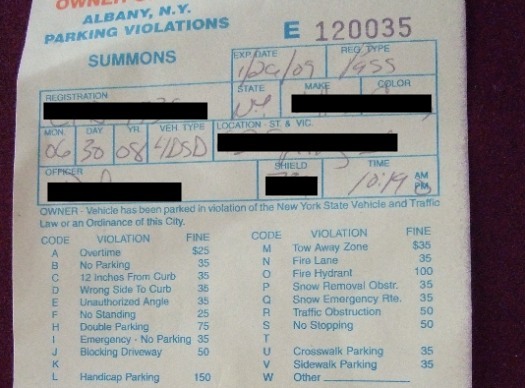 But it comes with a catch: Parking Violations Bureau says it doesn't update very often. I can't believe it! Pantaloons is on that list.... her real name is Janine Philpot. I thought that the city booted you after 2 unpaid tickets. Are these people perma-booted, or just really good at hiding their cars? Of course, I checked the list of outstanding tickets for the names of my friends who exclaim, after being ticketed, "I'm not paying this!" while ripping the ticket into shreds. I was always amazed at their rebellion and lack of fear for the boot. Apparently, they're not so rebellious after all. They so pay.